Marvel Premium Wine Cabinet, ML24WS. 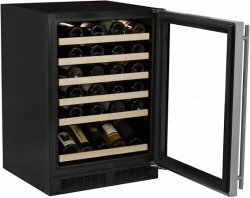 The 24” Single Zone, holds 45 bottles of wine in a single temperature zone wine cabinet. Please also note slightly different wine cabinet - ML24WSG1 Gallery Model with two angle display shelves. Due to the display shelving the overall bottle capacity of this model is reduced to 27 bottles. Usually this unit is around 100$ less than the ML24WS single zone model with the standard shelving configuration as indicated above. Rosehill offers the full range of the Marvel Wine Cellars. 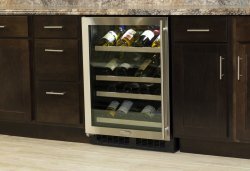 See differentiating features below for the Professional Series, High Efficiency and Standard Efficiency. .
A superior series of under counter wine storage Marvel offers 15", 24" and 30" wide cabinets specifically designed to be built into cabinetry. Marvel allows for the option of Stainless Steel, Black or Overlay ready panels in glass or solid door. Built in the USA, these American made cabinets adhere to stringent quality standards. Lock included for all models. 1" Stainless steel shelf facings. Full length glide out shelves. Zero Clearance hinges for true built in wine cabinet incorporated flush into cabinetry. 1¼" Maple wood shelf facings. Black framed Glass door available as an option. Same features as the High Efficiency but with standard cooling so the temperature within the cabinet may have greater variance. Cabinets with either single or dual temperature zones have a range of (40°- 65°F). Specify left or right-hand door hinge, when placing your order. Casters available as an option, please inquire. Filler strip is available for the 15" cabinets to fit into 18" cabinet spaces. Marvel has specific trading areas within the US. We may not be able to sell a Marvel wine cabinet into your area. What will determine your Marvel shipping cost? What else is important to know about your Marvel delivery? Professional Series - 3 Year Warranty.